What is this thing from my mother-in-law? I'm 2 seconds away from heaving it into the ole' garbage can. Hey, I have three of his cousins sitting in my kitchen window as I type this. 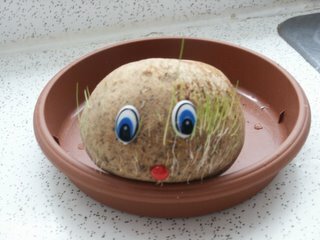 They are presently bald but we are hopeful that they will grow hair...but not facial hair like yours!